Ben, Grace and I hiked their favorite park in Denver, CO for their forest engagement photo shoot. The forest made for the most perfect backdrop for images. Trees that reached to the sky. Deer that watched us make funny faces at each other. Trails that go for miles. Then add in Ben and Grace with their love for each other. We have a recipe for amazing engagement photos. I like to start off each shoot with a couple traditional photos. Something a parent or grandparent would like printed on their walls. Then once we get those real fast we go play and be complete goof balls and laugh waaaay too much. Couples that play together stay together. That’s my motto. These two and their wonderful goofy sense of humor made my day. She’s probably picking his nose. ha! I’m pretty sure I made a joke… or was that Ben? Grace?… Too many funny jokes going on in our entire session to keep track. We hiked over 2 miles of trails I believe. These are the trails that Ben and Grace like to hike when they want a little exercise and just to spend some quality time together. It was really quiet there that day and very peaceful. It’s a place I’d love to return to. The park also had these really beautiful brides throughout too. We stayed closer to the bottom of mountain where most of these bridges were. We thought it would be a little fun to play king of the mountain… Ben won. 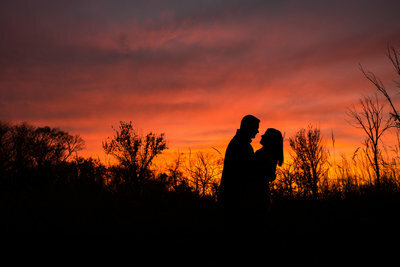 We were able to end their session with a true colorful Denver, CO sunset. Mountains in the background with beautiful skies above. Love these photos? Want to talk about booking your photo shoot? Please fill out the form here.